The study is set to begin in two weeks pending final IRB board approval. Afterwards, the protocol could be made readily available in underserved areas where access to conventional treatment is unavailable or unaffordable. It could also be used in cases where the conventional treatment is contra-indicated or has unacceptable side effects. Joan has already given instruction in auricular acupuncture to more than 90 Guatemalan midwives, community health promoters and students. Acupuncture has been well accepted and popular in the community. Her work is supported in part by the Integrated Health Project. This is the first time an auricular (ear) acupuncture protocol is being tested for this outside of China. Joan Boccino, L.Ac. a doctoral candidate in Acupuncture and Oriental Medicine, is trying to determine if ten small needles inserted in both ears have any effect on blood glucose levels . The “ear only” or auricular point combination she will use is derived from published literature and a survey of practitioners in the field. It is similar to another ear protocol known as the “NADA Protocol.” That combination was originally developed in the context of drug detoxification treatment in the 1970’s. However, it proved so effective that it’s use has expanded for use in general wellness and stress reduction including PTSD. In the US it is used in private practices, community settings, hospitals and by the US military. Joan developed #BoccinoProtocol with NADA in mind as the NADA protocol has historically been taught to community members who are not “medically trained” in addition to those within the healthcare field. Dr. BOccino knows the immediate need for pragmatic intervention in diabetes since she has been working in the Mayan Highlands since 2011. In 2012 colleagues and senior students from the Pacific College of Oriental Medicine joined Professor Boccino in founding a mission that is still on-going at the Barbara Ford Center for Peace in Quiche. 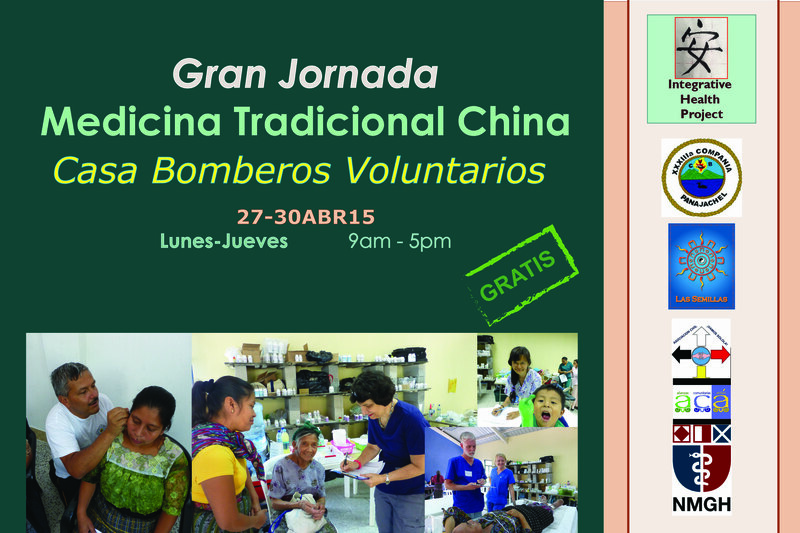 Last year, she brought a successful Traditional Chinese Medicine Jornada to the District of Solola. This year, her study is being coordinated with the assistance of The Diabetes Club which will provide patients and office space for the research in Panajachel. The study’s criteria calls for patients with a history of blood glucose levels above +125 They also must have the ability to test blood glucose levels — two times a day for four consecutive weeks. Twenty participants will all be issued meters, materials and given instructions for recording their data prior, during and after the study. During the second and third weeks of the study they will receive the acupuncture treatment. If this study is successful Joan can seek alliances with the Guatemalan government and educational institutions to discuss running a larger study. If results of that larger study are also successful, Joan can work with the appropriate agencies to develop a curricula of certification (and professional acknowledgement) for practitioners trained in this protocol. The study is set to begin in April pending final IRB board approval. Afterwards, the protocol could be made readily available in underserved areas where access to conventional treatment is unavailable or unaffordable. It could also be used in cases where the conventional treatment is contra-indicated or has unacceptable side effects. Joan has already given instruction in auricular acupuncture to more than 90 Guatemalan midwives, community health promoters and students. Acupuncture has been well accepted and popular in the community. Her work is supported in part by the Integrated Health Project. Dr. Joan Boccino The Integrative Health Project is leading a team of Traditional Chinese Medical practitioners and their students to the Mayan Highlands. These 23 generous people will be treating with TCM and training community health providers and first responders in the NADA Protocol. Joan has been donating her talents, here, for almost four years and , now, is developing an auricular protocol for Diabetes. Global Clinic will serve the communities of Panajachel, Panimache, Patanatic and San Antonio Palpolo with the support of several other NGOs and local businesses. White Paper submitted in partial fulfillment of World Bank Disaster Risk Management Course based on Hyogo Framework for Action (HFA.) It is a preliminary step twards rolling out workshops for Mayan Women and Children. It is preliminary to rolling out workshops for Mayan Women and Children. A generous group of New York acupuncturists have partnered with Dr.Joan Boccino, D.A.O.M. 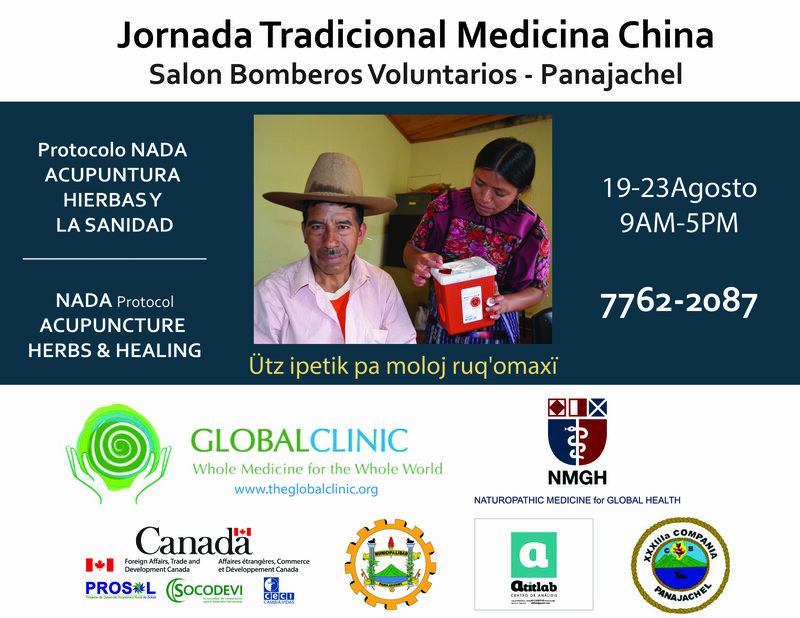 in Guatemala to establish an on-going Traditional Chinese Medicine outreach in Quiche and Solola. The mission coordinator was delighted to see her students’ and colleagues’ willingness The group treated 1,000 patients on their first visit in April, 2012 and the vision for a regularly scheduling an Jornada Medica (medical workshop) emerged over the summer. Chinese medicine students succeeded in raising funds for this August’s expedition and acupuncturists and several other volunteers from Joan’s original group offered to be the third wave the next fall. During the summer trip, 1,000 indigenous patients would be treated – this time in four locations. The Quiche Center would be home to The Integrative Health Project ‘s nascent residency program for almost three weeks. Yefim Gargoneishvili, L.Ac., went early to prepare a score of local health promoters in the use of NADA and other auricular protocol. And, Ann Brameier, L.Ac., would stay late for follow up sessions with, Dona Terry, a curandera and shaman. Team Yefim included three students from Pacific College of Oriental Medicine: Diane Chaing and Marc Lingat (both on their third mission to Guatemala.) and senior level student Saul Ackerman who interpreted for this portion. Yefim trained the local midwives, nurses and community practitioners while the students over saw the placement of the seeds or needles on the five specified ear points. To meet the standard, trainees had to “needle” 40 patients each under supervision but, even before that, they seemed confident about their delivery. During the Jornada they would get patient information forms with the prescribed number of positions. Patients, especially the younger ones getting seeds, were totally at ease getting non-Western treatment. On Sunday, after the treatment rooms were stocked and all set up, PCOM students would get a brief lecture from Moshe Heller, L.Ac.. He demonstrated the Shoni Shin kit used in Japan for children. He said that young kids were usually fine with needles until they are about two; after that, there comes a time when children refuse. He showed how to palm these small tools, so that children do not see the points and told the students about how he uses different instruments to stimulate channels and particular points. Day One of the Jornada would begin so early that the mist was still snuggling in the rose gardens. Eva, Byron, Tomas and Riccardo trudged out to open the registration table under a tent and brought out a bushel of prophylactic bananas – just in case the patients had not had any breakfast. The straggle of interpreters was greeted with joyous shrieks and mini reunions happened all around. Pablo, Sara, Angel, Sisters Connie and Irma came first. Marisela and her husband showed off their gorgeous baby and everyone got to meet Veronica and Laura’s mother and grandmother because the older ladies had come along so Laura’s newborn could be seen. Tommy from Belize was only new for a while; then, he blended right in. There was very little time to socialize before the long days began. The translators worked crazy hours all week moving from location to location and language to language, Santa Cruz to Zacualpa to Cotzal, English to Spanish to Quiche and later, in the Nebaj area, Ixil. The August 2012 group was twenty New Yorkers including seven acupuncturists; two of whom, Daryl Thuroff and Jane Hansen were also massage therapists and one student who is also an LMT. There were six returning students including second timers Joelle Ludwig and Theodora Karaivanova and third timers Mike Zielonka and Chelsea Horenstein; plus, five fresh ones: Elizabeth Zara, Erin Callahan, Kathryn Herrera Maria Macchia and graduating senior, Jen Marks. Except for the threat of hurricanes stalling outbound flights, this workshop ran smoother than the first and delivered good care to patients in four locations. things went so well that acupuncturist/anthropologist, Wendy Whitman, who conducted two field interviews, is considering bringing her daughter along next time. Support this work. Un grupo generoso de Nueva York acupunturistas se ha asociado con Centro de Paz Barbara Ford en Guatemala para establecer un continuo acercamiento chino tradicional Medicina. Coordinador, Joan Boccino, L.Ac., estaba encantado de ver la voluntad de los estudiantes y colegas “para aumentar la frecuencia de sus visitas y respirar continuidad en el Proyecto de Salud Integral. IHP tratado 1.000 pacientes en su primera visita en abril de 2012 y la visión de una forma regular programando una Jornada Medica (taller médicos) surgieron durante el verano. Estudiantes de medicina china logró recaudar fondos para la expedición de este mes de agosto y los acupunturistas y varios practicantes del grupo original se ofreció a ser la tercera ola en el otoño. Durante el viaje de verano, 1.000 pacientes indígenas serían tratados – esta vez en cuatro localidades. El Centro de Quiché estaría en casa para el IHP durante casi tres años. Yefim Gamgoneishvili, L.Ac., se fue temprano para preparar una veintena de promotores locales de salud en el uso de los NADA y otro protocolo auricular. Y, Ann Brameier, L.Ac., me alojaría tarde para sesiones de seguimiento con doña Terry, una curandera y chamán. Equipo Yefim incluidos tres estudiantes de Pacific College of Oriental Medicine voluntarios: Diane Chaing y Marc Lingat (tanto en su tercera misión a Guatemala.) Y superior nivel de los estudiantes Saúl Ackerman quien interpretó para esta parte. Yefim capacitado a las parteras, enfermeras y profesionales de la comunidad, mientras que los estudiantes más vieron la colocación de las semillas o las agujas de los cinco puntos de la oreja especificados. Para cumplir con la norma, los alumnos tuvieron que “aguja” 40 pacientes cada uno, pero bajo supervisión, incluso antes de eso, se mostró confiado sobre su entrega. Durante la Jornada, que obtendrían las formas de información al paciente con el número prescrito de posiciones. Los pacientes, especialmente los más jóvenes reciben semillas, estaban totalmente a gusto recibiendo tratamiento no occidental. El domingo, después de que las salas de tratamiento fueron sembrados y todo listo, los estudiantes PCOM obtendría una breve conferencia de Moshe Heller, L.Ac.. Demostró el kit Shoni Shin utilizado en Japón para los niños. Dijo que los niños pequeños son generalmente muy bien con agujas hasta que son alrededor de dos, después de eso, llega un momento en que los niños rechazan. Mostró cómo la palma estas pequeñas herramientas, por lo que los niños no ven los puntos y dijo a los estudiantes acerca de cómo usa diferentes instrumentos para estimular los canales y puntos particulares. Primer día de la Jornada se iniciaría tan temprano que la niebla aún estaba acurrucado en los jardines de rosas. Eva, Byron, Tomás y Ricardo caminó hacia fuera para abrir la mesa de registro en una tienda y sacó un bushel de plátanos profilácticos – sólo en caso de que los pacientes no habían tenido ningún desayuno. El rezago de los intérpretes fue recibido con gritos de júbilo y reuniones pequeñas sucedieron a su alrededor. Pablo, Sara, Angel, Connie y hermanas Irma era lo primero. Marisela y su marido mostraron su bebé precioso y todo el mundo dieron a conocer a Verónica y la madre y la abuela de Laura porque las señoras mayores habían venido a lo largo de lo que Laura recién nacido podría ser visto. Tommy de Belice fue sólo durante un tiempo nuevo y, a continuación, se mezcla la derecha adentro había muy poco tiempo para socializar antes de los largos días comenzó. Los traductores trabajaron hora loca toda la semana moviéndose de un lugar a otro y de una lengua a otra, Santa Cruz de Zacualpa a Cotzal, Inglés para españoles para quiche y más tarde, en la zona de Nebaj, Ixil. El grupo de 08 2012 tenía veinte años neoyorquinos incluyendo siete acupunturistas, dos de los cuales, Daryl Thuroff y Jane Hansen también terapeutas de masaje y un estudiante, Alice Kim, quien también es LMT. Había seis estudiantes que regresan como segunda Ludwig temporizadores Joelle y Karaivanova Theodora y tercer temporizadores Zielonka Mike y Horenstein Chelsea; además, cinco pilas nuevas: Zara Elizabeth, Erin Callahan, Kathryn Herrera Maria Macchia y se gradúan de marcas de alto nivel, Jen. A excepción de la amenaza de los huracanes dilatorias vuelos de salida, este taller corrió más suave que el buen cuidado primera y entregado a los pacientes en cuatro localidades. las cosas iban tan bien que acupuntor / antropólogo, Wendy Whitman, quien llevó a cabo dos entrevistas de campo, está considerando llevar a su hija a lo largo de la próxima vez.